Pitchers and Catchers Report. What Do these beautiful four words mean? To me it marks the end of Winter and the beginning of Spring. It means palm trees and the sound of batted baseballs. It means sun screens. It means mornings of hearing from beat writers about workouts on dewy grass outfields. It means batting cages and practice mounds. It means we finally will start getting baseball news everyday! Getting daily baseball news about Pitchers and Catchers reporting brings me such freshets of pleasure. We baseball fans await with much anticipation baseball news and that special sense of the upcoming season that feed our eternal hopes every Spring. We soak-up all the quotes from our grizzled Pitchers and Catchers. 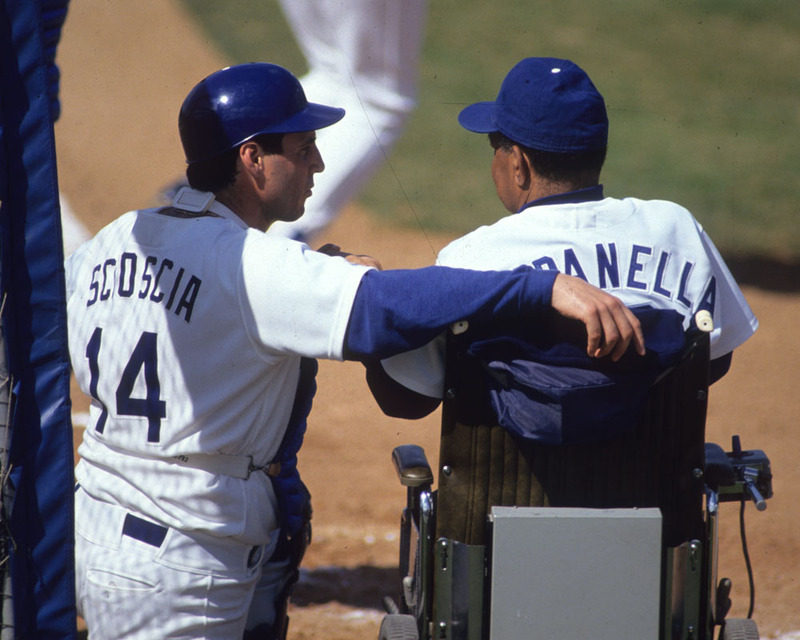 Mike Scioscia with Roy Campanella. Pic by Jon SooHoo.